Thrash's remembrances are evinced with clear, wide-eyed illustrations colored with a dreamily vibrant palette. She has so carefully and skillfully captured a universal moment—the first time one realizes that things will never be the same—that readers will find her story captivating. A luminescent memoir not to be missed. In this poignant memoir, Thrash examines a pivotal summer, marked by first love, self-discovery, and some difficult realizations...The tone is spot-on, varying from funny and quirky to quiet and contemplative, and Thrash seamlessly weaves in light, turn-of-the-millennium pop culture touchstones like the Backstreet Boys with darker historical references (the “Don’t Ask, Don’t Tell” policy)... An insightful and thought-provoking work. Thrash writes with an intoxicating mix of candor, irony, and fresh passion. Much of the memoir’s piquancy comes from the collisions between the camp’s ideal of Southern womanhood, the campers’ clannishness, and Maggie’s faith in herself as she becomes, incongruously, the camp’s best rifle shot. This is the kind of memoir that stays with readers for days. Thrash's unvarnished retelling of her adolescent experience is neither glamourizing nor self-deprecating—and the salty realism makes the story engrossing and quite funny. Though lesbian and questioning teens may be especially responsive to the narrative, any young reader will see in Maggie and her friends a relatable sort of confident confusion. This is immediately engrossing, both poignant and hilarious, as the personable and likeable Maggie nails typical adolescent experiences with particularly wicked camp descriptions. While loosely based on the author’s circumstances, Maggie’s portrayal of her first love and heartbreak is everyone’s story, whether gay or straight, male or female. Maggie’s emotions are sharply honest, with readers feeling her exhilaration, anxiety, awkwardness, confusion, and pain. [Wipes away tear.] 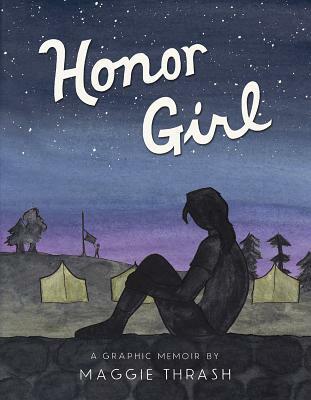 Honor Girl is, all at once, heartachey (but never precious), dry-witted (but not cynical), and incredibly beautiful. Maggie Thrash has not only given us a unique addition to the canon of intelligent-young-woman-centered comics, but a reminder of the rewards of opening yourself up and exposing your own vulnerability – in love and in writing. Honest, funny, and so real you can smell summer camp while you read it, Maggie Thrash’s Honor Girl hits dead center. Honor Girl beautifully portrays the awkward excitement and heartbreak of first and forbidden love. I couldn’t put it down, even while my heart was aching. I loved this book! Graphic memoirs are my JAM, and I love this coming-of-age story from Maggie Thrash. It recounts Thrash’s experiences at a Christian summer camp as a teenager, and her basically trying to figure out if something was wrong with her because she was attracted to girls. It sounds sad, but Thrash keeps it from being depressing with her lively story and honesty.